Cold Plasma will be used intraoperatively. After the surgeon removes a tumor, Cold Plasma will ablate the microscopic cancerous tissue at the margins. The intent is to minimize the chances of cancer recurrence. 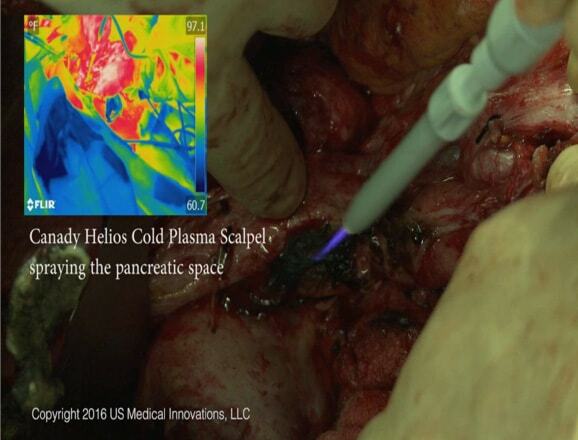 It has been proven in the vitro and in vivo that USMI’s breakthrough cold plasma spray, when used following chemotherapy and surgery with the Hybrid Plasma Scalpel, can selectively target and eradicate cancer cells. In March of 2015 the company completed a “Compassionate Use” case approved by the FDA, with additional 2 cases performed in 2016 and 2017. Cold atmospheric plasma (CAP) provides a unique, rich environment of reactive oxygen species (ROS), reactive nitrogen species (RNS), charged particles, photons, and electric field. This unique combination of chemical and physical properties of CAP technology has enabled recent biomedical applications including cancer therapy. Some chemical components of the CAP are highly selective, such as ROS, which might promote a “plasma killing effect,” while others such as RNS could produce a “plasma healing” effect. Combining these species in various controlled blends provides an unprecedented potential to activate specific signaling pathways in cells. Combining RON species in various controlled blends provides an unprecedented potential to activate specific signaling pathways in cells. What makes plasma absolutely unique is its ability to self-organize and form coherent structures. These coherent structures modulate plasma chemistry and composition, including reactive species, the electric field and charged particles. These coherent structures tend to modulate plasma chemistry and composition, including reactive species, the electric field and charged particles. Formation of coherent plasma structures allows the plasma to adapt to external boundary conditions, such as different cells types and their contextual tissues. As result, plasma interaction with cells is altered leading to differential effect of plasma on different cells, i.e. selective killing of cancer cells in comparison with normal cells. 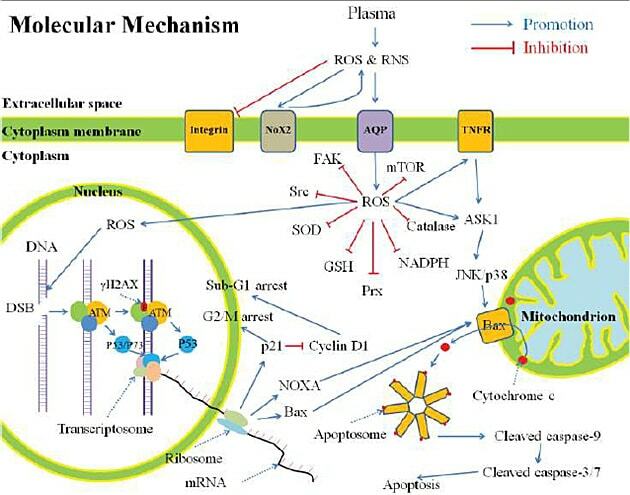 The mechanism by which CAP affects the cancer is based on the production and efficient delivery of reactive oxygen and nitrogen species (RONS) analogous to those produced naturally by cells. CAP is capable of gentle non-thermal modification of the radical balance in cells leading to apoptosis rather than necrosis. In contrast, conventional lasers in medical devices are based on the thermal interaction with tissues, which lead to necrosis and permanent tissue damage. Tuning the gas pressure (helium), gas composition (helium/oxygen) and energy can control the chemical responses of the tissue to a CAP jet. Various chemical components of the CAP jet (e.g. RONS) are highly selective, such as oxygen, which might promote a “plasma killing effect”, while nitric oxide could produce a “plasma healing” effect. Conceptually, it is the introduction/delivery of these potentially selective toxic ion-species into the tumors through diffusion processes and the electric field produced by plasma that will form this foundation of new cancer therapy. Recently our group and other groups world-wide reported that the CAP jet; a) selectively kills cancer cells in vitro with a significantly lesser effect on normal cells; and b) significantly reduces tumor size in vivo. We established the following mechanism to describe the plasma effect: the synergistic effect of selective diffusion of RONS into tumor cells (via activation of the aquiporins (AQP)) and the high basic RONS level in tumor cells would make a dramatic difference in the response of normal and tumor cells to CAP, thereby crossing a survival threshold for tumor cells and leading to cell death through DNA damage, apoptosis or cell cycle arrest. In addition, we also showed that the RONS metabolism and oxidative stress-responsive genes are deregulated following CAP application, and the differential effects of CAP on various cancer cells results in G2/M arrest. Fewer normal cells were in S-phase (~10%) compared to the two cancer cell lines (transformed cells are highly proliferative): ~50% for 308 cells and ~45% for PAM212 cells. No increase in the fraction of cells in the S-phase after CAP treatment was observed for the three cell types: their number either remained the same or decreased. However, we did observe an increase in the ranging of standard deviation value of CAP treated cells in S-phase of around ~20% for all three cell types suggesting that not all cells within the population of cells responded the same to CAP treatment. While there is no significant difference in the numbers of cells in the Sphase of the cell cycle, one can see that the number of cells in the G2/M fraction increased by ~25% for normal cells and two- to threefold for transformed cells. The increase in the fraction of cells at the G2/M-phase of the cell cycle is accompanied a decrease in the number of cells in the G0/G1 fraction. This study also shows the general trend in the distribution of cells within the cell cycle and indicates that timing of the cell cycle is different for chosen cells. Overall analysis of CAP effect on carcinoma, papilloma and glioblastoma cells suggested that the CAP treatment causes significant arrest in the G2/Mphase. As such CAP treatment can be combined with chemotherapy and radiation therapy targeting cancer cells in specific phase of the cell cycle. It should be pointed out that CAP is very different from chemotherapy and radiotherapy, though many chemotherapy and radiotherapy also increase intracellular RONS stress and further kill cancer cells. The primary difference is that CAP itself is the source of RONS including hydrogen peroxide, nitrite, nitrate and nitric oxide. The complex nature of cancer makes it difficult to develop effective treatments. Targeted cancer therapies are defined as substances or methods that block tumor growth by interacting with specific molecules or that focus on treatments to cancer specific molecular and cellular changes. Several targeted cancer therapies exist today. Examples include chemotherapy, radiotherapy, and molecularly targeted drugs. 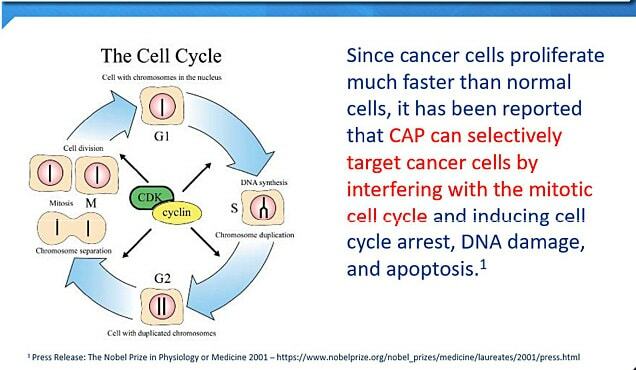 One way to target cancer cells is to interfere with the cell cycle. Cancer cells proliferate at a faster rate than normal cells. Combination therapies are proved to be most effective; they impact cancer cell biology at multiple signal transduction pathways resulting in a synergetic effect. The goal is to trigger cells to execute what has been referred to as “the cell death pathway” or apoptosis. A major hurdle in treating cancers is preserving surrounding normal tissue while inducing death of the cancer cells within a tumor. While progress is being made at developing treatments that are selective for cancer cells, cancer treatment damage to normal cells within tissues remains a major problem in oncology. Cold plasma has demonstrated great potential for cancer treatment in vitro. It was shown that cold plasma treatment demonstrates a selective effect by causing apoptosis primarily in cancer cells. A strong selective effect was observed in case of lung cancer. Both murine macrophages and B16 melanoma cells were treated with the cold plasma device and it was clearly shown cold plasma jet has a more selective effect on murine melanoma cells. It was shown that CAP treatment selectively kills breast, neuroblastoma, head and neck, bladder, pancreatic, liver cancer cells. In vivo study reveals that a single plasma treatment leads to tumor ablation with neighboring tumors unaffected. We found that tumors of ~5 mm in diameter are ablated after 2 min of single time plasma treatment, while larger tumors decreased in size. Overall a single transcutaneous cold plasma treatment induced ablation of the tumor through the overlying skin. GBM is a highly malignant very aggressive neoplasm of the central nervous system characterized by rapid growth, extensive angiogenesis, and resistance to all current therapies. Thereby, GBM is associated with poor survival and high mortality where approximately 7,500 patients die from GBM each year. Treatments of GBM tumors remain largely palliative despite recent advances with the integration of multi-modal therapies. The standard of care for newly diagnosed GBM is maximal surgical resection followed by six cycles of concurrent radiation and chemotherapy (i.e. Temozolamide, TMZ), which has been shown to only improve median survival up to 14.6 months and a continued dismal five-year survival at less than 10%. The major limitations of tumor treatment and eventual tumor recurrence are: (a) the tumor cells are very resistant to conventional therapies; (b) the brain is susceptible to damage with conventional therapies; (c) the brain has a very limited capacity to repair itself; and (d) many drugs cannot cross the blood–brain barrier to act on the brain tumor. Thus, it is necessary to develop novel tools that can provide selective targeting of proliferating tumor cells and also enhance existing therapies. In order to evaluate effect of CAP on brain tumor, micro-CAP device was developed and directly applied to glioblastoma tumors in the brain of living mice via an implanted endoscopic tube. Using in vivo bioluminescence imaging, the tumor volume in a control animal (helium only) increased nearly 600% over the course of two days, whereas micro-CAP-treated tumor volume decreased approximately 50% compared with baseline levels. In the control animals, there is a clear increase in tumor volume over the 2-day period. In contrast, micro-CAP-treated animals fell below baseline values. These striking findings demonstrate the potential of CAP to inhibit glioblastoma tumor growth in vivo. Given these findings, it can be suggested that cold plasma represents a promising new adjunct for cancer therapy, offering the ability to directly target and selectively kill neoplastic tissue. Notably, CAP device provides a method for practical administration of this cancer therapy. Plasma therapy could potentially target internal malignancies via an endoscopic delivery system, thus enabling this technology to serve as either a standalone treatment option or, more realistically, an adjuvant to existing therapies. 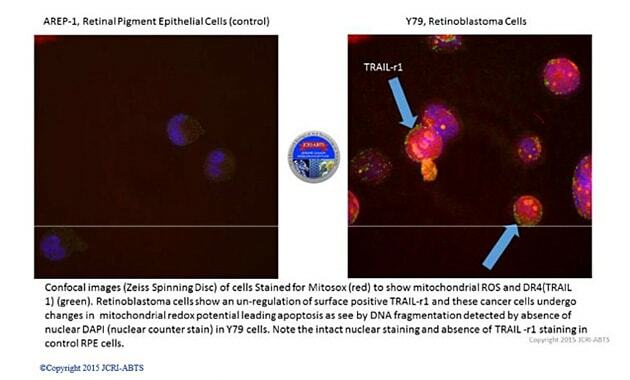 With regards to the above strategy, we have reported that CAP promotes generation of intracellular ROS inducing the apoptosis in DBD plasma-treated melanoma cells . Variety of active neutral short- and long-living ROS are formed in CAP including OH, O, electronically excited oxygen O (1D), O2 (1Δg), O3, HO2, H2O2. RNS species such as NO2-, NO- and NO+ are induced directly in CAP and through post-discharge processes in plasma-activated liquid mediated by peroxynitrite (ONOO-). In addition, the peroxynitrite chemistry was also shown to significantly participate in the biological effects of CAP-activated liquid media. Short-lived ROS generated by CAP might react with medium components (e.g. amino acids) to form long-lived reactive organic hydroperoxides. These in turn induces the lipid peroxidation and cell membrane damage and activate intracellular signaling pathways resulting in apoptosis. Exposure of cancer cells to CAP induces apoptosis in a caspase-dependent manner, and this effect is likely related to production of ROS by CAP and DNA damage induced due to intracellular ROS. ROS that are produced directly by CAP in air or in the media can subsequently diffuse into the cells through the cell outer membrane or react with this membrane to produce intracellular ROS via lipid peroxidation. Specifically we need to point out on aquaporin (AQP) channel that was proposed by our group. Cancer biologists confirm that most cancer tissues tend to express more AQPs on their cytoplasmic membranes than homologous normal tissues. 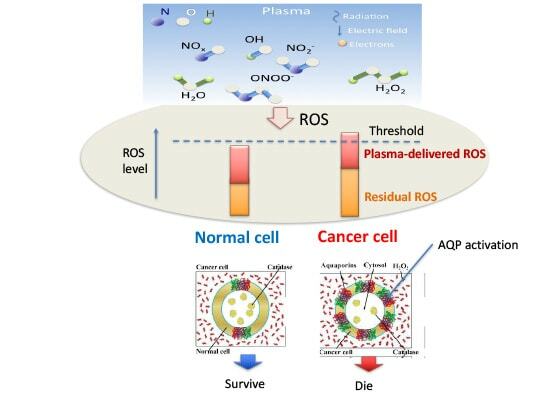 After the CAP treatment, CAP-originated H2O2 diffuses into cancer cells significantly faster than homologous normal cells, causing a significantly higher rise of ROS in cancer cells than normal cells. Such different H2O2 consumption capacity between cancer cells and normal cells may be the foundation of the selective anti-cancer mechanism of CAP. The overall possible process of CAP interaction with cell and consequent cell response is shown in Figure below. CAP treatment might lead to intracellular ROS increase. Both processes are correlated with apoptotic pathways.